When it comes to styling men’s hair, nobody does a better job than a barber. We all lean back into the comfy cushions of their chairs and watch in awe as they manipulate our miserable mops in to styles that are fit for the catwalks. Even Beckham would be proud. But after one magnificent evening of appreciation our inability to maintain these masterpieces is exposed. This leaves us with flat lifeless hair until our next appointment. Thankfully, times are changing. As men, we are starting to take a more invested interest in our appearance. The result? Our barbers are starting to take the time to educate us in the wizardry of hair styling. Well, the good barbers are any way. 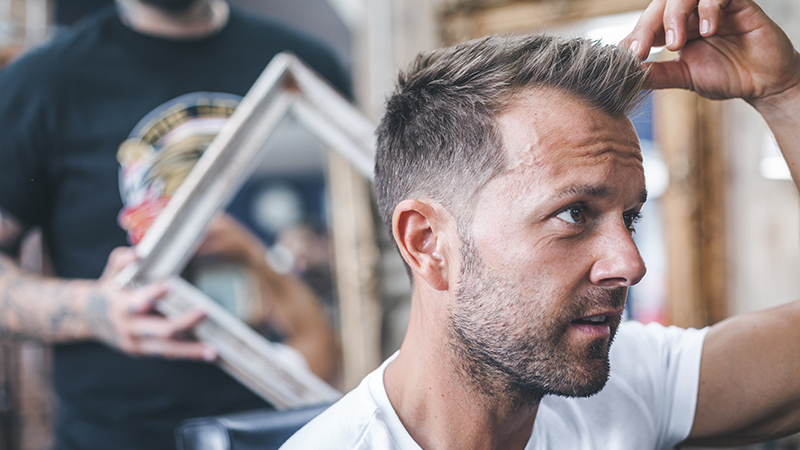 To show you that it’s possible to get a barbershop-quality style from the comfort of your own home, we’ve enlisted the help of award-winning barber Tom Chapman.  Below, he shares his styling secrets with you. • A good shampoo and conditioner. • A pre-styling product such as hair gel or sea salt spray. • A vent brush or quiff roller. • A finishing product of your choice such as matt clay or pomade. The first step to achieving flawless hair is to make sure you are working from a clean canvas. Boasting long clean locks himself, Tom clearly practices what he preaches. He suggests, “using a premium shampoo and conditioner to help remove the build-up of products that come with everyday styling.” It’s also worth noting that a refreshing shower in the morning will help to neutralise any oily build-ups from the day before, and any unnatural patters/partings that develop while sleeping. 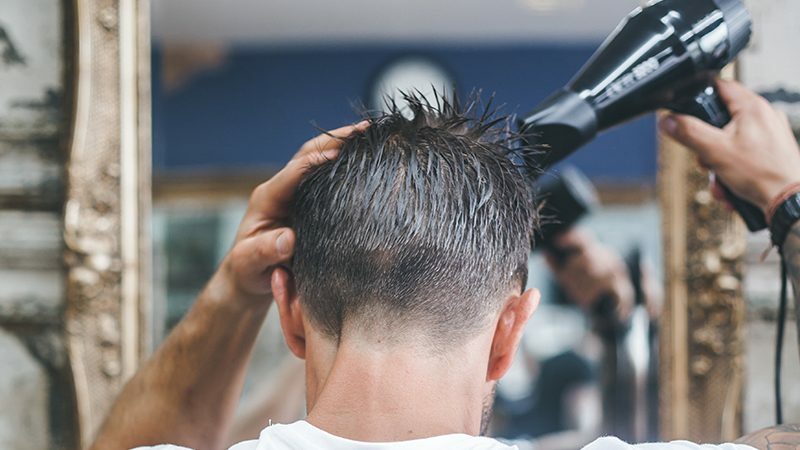 One of the main differences between the mess you create and the masterpiece your barber sculpts is their use of a hairdryer, brush, and a pre-styling product. Adding a little product to support your clean damp hair before blasting it with heat will help to lock it in place and add volume and texture. There are many products you could use for this process, but the main three Tom suggests are hair gel, matt paste and sea salt spray. Thanks to the evolution of men’s grooming there are more styling products at your fingertips then you could ever imagine. From clays to pomades the list is endless. A little experimentation might be required, but in time you will find the one that’s perfect for you. Once you do, it’s important that you add a little to your hair after every blow dry. This final step is what separates flat hair from fame-worthy hair. A little of your favourite product flicked through the tips of your hair will help to add the extra definition needed to turn heads all day long. 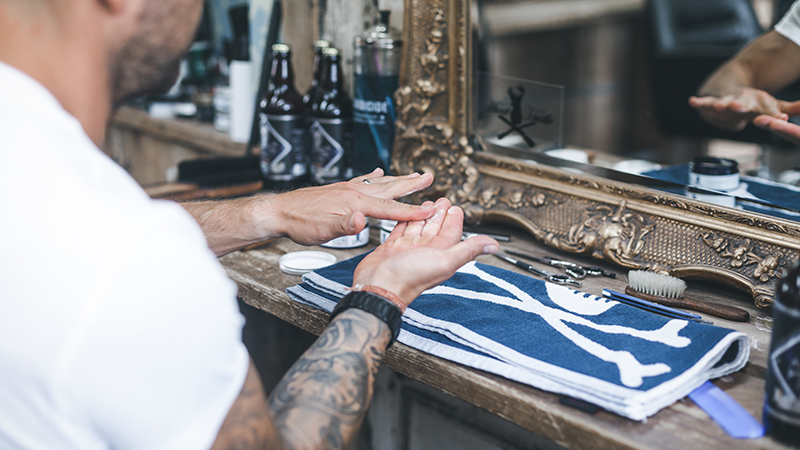 With The Bluebeards Revenge you can maximise your attempts to master barbershop-quality styling. Our extensive range of professional products will help you to define your style all year round. For more information on our products and services, browse our website and social media channels! Why are barber poles red, white and blue?